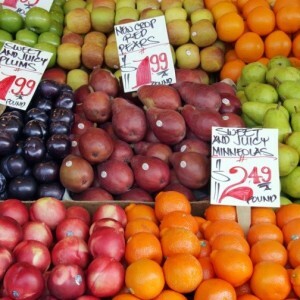 Farmers markets are becoming more and more popular these days in cities and towns in the USA and worldwide. Food is locally grown and therefore what you can get is dependent on the seasons. It is often organic as well. All this means that the food you are buying meets the standard of the least environmentally destructive way you can buy food. In 2008 the US Department Of Agriculture listed up to 4685 farmers markets in the US. In 2012, five years on, the number of farmers markets had risen to 7864, a 68% increase. This rise in farmers markets has been attributed to the growing interest in fresh food products and purchasing them straight from the farm. Many students living independently, like Indiana University South senior Hailey Hennessey, now she buy up to 95% of all groceries from farmers markets or nearby co-ops. Hennessey says while watching the documentary, Food, Inc she had a revelation about food, food sources and the environment. Made in 2008, Food Inc takes a critical look at the corporate food industry. She says the film really opened her eyes and got her questioning her practices and the food that she ate. Hennessy now thinks there is a growing trend with other students at college who are opting for locally grown food. Some colleges also incorporate their own hobby farms where students can learn how to grow organic food for themselves. This can be a great opportunity for students to not only learn to sustain themselves but also a way to look for when buying vegetables in the store. Because of this growing trend, students are now becoming more aware of environmental best practises when it comes to buying groceries.